Got Spring Fever? Searching for Spring Break Ideas? Spring has finally sprung at America’s Action Territory, Family Fun Park! Celebrate the end of one of Wisconsin’s longest and coldest winters with, Special Spring Break Hours, listed below, and Spring Fun, Discounts, April 17-27th. Action Territory’s Spring Break Specials are designed to let you, LET GO! Let go of that Cabin Fever, let go of that cold weather- snow overload frustration, let go of those never ending winter ho-hum blues, and LETS GO to America’s Action Territory Fun Park in Kenosha, WI! 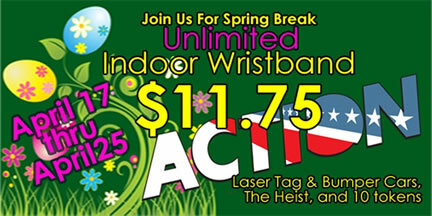 • Unlimited Indoor Wristsbands ONLY $11.75 per person! This hot deal includes, Unlimited Laser Tag, Bumper Cars, The Heist, and, Ten Arcade Tokens! Action Territory gives you the ultimate Laser tag experience with the latest in technology, a state of the art facility and accessories, AND the opportunity to experience The Heist, THE ULTIMATE Lazer Maze Conquest! The Bumper Cars are a blast for guests 44 inches high and taller, and the Arcade is the EXTREME experience for game enthusiasts. • If it IS the Arcade Action you love, Action Territory’s, Double Tokens Spring Break Special is the ideal deal for you! Buy ANY amount of Arcade Tokens, and get the same amount of tokens FREE! Action Territory offers rows and rows of ringing bells and colorful lights, with over 150 video and redemption games to redeem at Action Territory’s Prize Center! • On Thursday April 17th, and Thursday April 24th, get Unlimited Bumper Cars, AND Unlimited Laser Tag, BOTH FOR ONLY $5 BUCKS from 4pm to 9pm! Yes, that’s $5 Bucks TOGETHER, for unlimited fun including both of your Action Territory favorites! *These offers are good ONLY during America’s Action Territory’s Spring Break Celebration April 17th-25th, 2014. 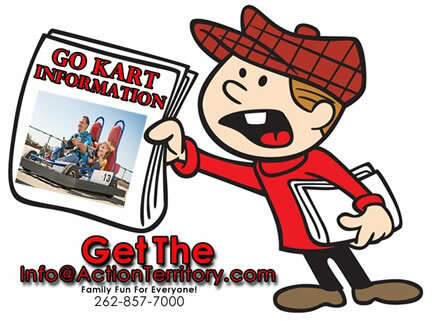 Outdoor attractions are open with weather permitting, and Spring Break comes just in time for the New Hours and Spring Opening of the Go Kart track! Blast around the 1,100 foot log 30 foot wide track featuring Grand Prix action! Be sure to always log on to the website at http://ActionTerritory.com for the current weather conditions, and hours of operation for the outdoor attractions. If you’re planning a visit to the Milwaukee or Chicago-land area, Action Territory is a must stop for family fun. Open year round, America’s favorite family fun park entertains thousands of visitors every year. Located just 45 minutes From Chicago’s O’Hare Airport and the Milwaukee area. The facility is considered home for the area's best birthday parties and has been voted the area’s, BEST FAMILY FUN, attraction location.